Casa de la Esperanza is a 32-unit residential community dedicated to helping agricultural workers. The community is owned and operated by the Boulder County Housing Authority in the City of Longmont. This center provides educational and recreational services to Casa residents, including an onsite “after-school” program and academic center. Community Action Programs worked with the Boulder County Commissioners, the Boulder County Housing Authority and other community members to make this award winning housing community a reality. The first migrant families moved in during the fall of 1993. CAP staff worked with the site manager to hire a bilingual coordinator June 1994. For over twenty years, the program has been responsive to the unique needs of the dozens of farm workers families of the Casa de la Esperanza community. The program has served hundreds of families and children over the years. Casa de la Esperanza’s educational center is a state-of-the-art learning center providing opportunities and resources toward excellence and self-empowerment through collaboration and programming that nurture each individual’s potential. Our vision is one of a thriving self-sustaining community sharing wisdom to transform society through today and tomorrow’s leaders, honoring those who came before us. The Casa de la Esperanza program was initiated to serve the 100+ children and youth living on site. Partnerships with local agencies and groups provided many resources and services that have greatly benefitted the community for several years. Hundreds of volunteers from the local universities, corporations and the community have contributed thousands of hours of service to the Casa community annually as tutors, robotics mentors, teaching classes, organizing activities and events. The Casa de la Esperanza Learning Center operates Monday to Thursday, throughout the year with occasional weekend activity. Hours of operation are from 3:00 – 8:00 p.m. for the fall and spring semester. The summer session runs for six weeks. Be a part of the solution. Invest in our youth. You can always fill out the Casa de la Esperanza Volunteer Application and one of our program coordinators will respond to you. This program provides incredible opportunities that promote 21st Century skills in the areas of technology, the sciences, math and engineering. The Casa de la Esperanza Robotics Academy was developed in the spring of 2007 to foster student’s engagement in their own education as they work with professional mentors in preparation for a robotics competition. These regional competitions are held at universities such as: University of Denver, University of Colorado at Denver and Boulder campuses, Regis University and others. The Casa Robotics Academy includes: JR. LEGO Robotics (ages 6-9 yrs. ), LEGO Robotics (9-12 yrs. ), VEX Robotics for 5-8th grade students, FIRST Robotics Competition for high school youth. 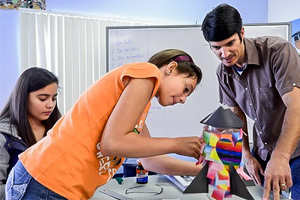 Other STEM activities include math, science and computer technology classes and projects. Aerospace. Alternative energy. Engineering. Environmental science. Agri-science. Veterinary science. These are just a few of the programs that 4-H youth participate in everyday and learn new skills that make a difference in our communities. It prepares our youth to make a positive impact in their communities and the world. NASA funded summer camp designed to get Casa de la Esperanza kids interested in math, science, and rockets. It is a unique five year program designed to teach middle school students about science and engineering through hands-on projects. As part of the program students learn Newton’s laws of motion, basic engineering, physics and other by using rockets as tools to teach students. It is the hopes of program inspire students to be our next astronauts, scientists, engineers and mathematicians. This program nurtures academic achievement by providing the necessary services and resources to enable students in K-12th grade to attain success in school. Tutoring provided by dozens of volunteers and program staff is crucial in creating a Pathway to Higher Education promoting high school and college graduation. This support includes a rich array of classes and enrichment opportunities, campus visits, fieldtrips, college assistance, youth internships and special events. What services does the Casa de la Esperanza Learning Center provide? The Casa de la Esperanza Learning Center provides academic support and enrichment opportunities to overcome the economic, linguistic, cultural and other challenges these youth face. Our goal is to achieve educational success towards greater self-sufficiency. A high level of collaboration among local partners, donors and volunteers supports the community with valuable resources and services. The program runs Monday-Thursday from 4:00 – 8:00 p.m. during the school year and Mon-Thurs from 2:00-8:00 p.m. in the summer. Does the Casa de la Esperanza Learning Center have volunteer opportunities? Yes, the Casa de la Esperanza Learning Center offers an array of volunteer opportunities. Casa volunteers play an essential role enhancing the program services. Volunteers can teach classes in areas such as math, art, yoga, martial arts, digital photography, language and culture, and much more. Volunteers organize literacy groups, tutor small groups of students or offer one-on-one academic assistance. Other volunteers contribute to the Casa de la Esperanza Robotics Academy as mentors helping the students prepare for their robotics competitions. Casa has special events for the holidays, field days and offers community service learning projects which also require volunteer assistance. We tailor your volunteer efforts to your specific skills and interests. Your talents will be much appreciated. To volunteer, please contact the program coordinator, Vanessa Escarcega at 303-678-6220 or by email at vescarcega@bouldercounty.org. You will be invited to a site interview and will need to fill out necessary paperwork including a background check. Does the Casa de la Esperanza Learning Center accept donations? The Boulder Community Housing Corporation is the non-profit 501(c)(3) organization that serves as the umbrella agency for the Casa de la Esperanza Learning Center. As such, we depend on local foundations, corporate sponsors, and donors in the community to offer financial support to the Casa de la Esperanza learning center. P.O. Box 471 Boulder, CO 80306. Please contact Vanessa Escarcega at 303-678-6220 or vescarcega@bouldercounty.org to donate the following: Clothing (coats, gloves, scarves, jeans) Books (bilingual, Spanish, English) Supplies (art, school and computer) Christmas gifts and gift cards for the families.